← Discovery Communications and it’s Stars to ring opening bell at NASDAQ Thursday morning! Vote for Sig Hansen now, as 2008 Most memorable Reality Performer! Sig Hansen–globally known as the skipper of the F/V Northwestern–has been nominated, and is a contender for the Fox Reality Channel 2008 Most Memorable Reality Performer! In order to actually win, he’ll need all Your Votes! That’s right, the public is in charge of who wins the Really award! If you’d like to show your support for ‘Deadliest Catch’ and Sig Hansen, head on over to the Fox Reality Channel website, register, and vote up to 10 times a day for the next 3 days! The competition: Corey Feldman from The Two Coreys, Carrie Ann Inoba from Dancing with the Starts, Holly Madlson from The Girls Next Door, and DeAnna Pappas from the Bachelorette. 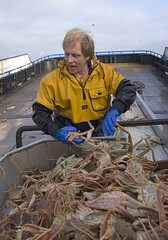 This entry was posted in Awards, Sig Hansen and tagged Deadliest Catch, Fox, Reality, Really, Sig Hansen. Bookmark the permalink. 9 Responses to Vote for Sig Hansen now, as 2008 Most memorable Reality Performer! But but but what about Edgar? *sigh*. Okay. I’ll get over there and vote for Sig. each other, in so many ways. Without one, there is no other! i’ m igor from italy, sig you are siply the best!!! you, your crew, and all the guy working on the crab boat are simply grate!! Look at him sort, what a guy. How does someone get nominated? These fisher folks are amazing and of course I have no problem voting for Sig Hansen – or Edgar – they both have Norwegain sounding names and might have roots back here – I heard one on the boat were going on holliday to Norway, and they were counting in Norwegain as well – so it would be fun to get in touch to ask them – anyone knows if that is possible? – maybe my grandad knew theirs ,, who knows. No way, baby. It’s Johnathan Hillstrand all the way! He gets our vote too. Good luck from all ous norwgians who follow the Northwestern on Discovery Chanal.